X-10 Remote Control Console BSR Model X10-014311 -Sale & help comments reviews. Remote X10 Control Console. Features; Press just one button to light up your house, Control up to 16 lights, appliances TV's and stereos from anywhere in the home. Command Console sends signals over house wiring to inexpensive plug-in modules. This console is used, it works, but some of the buttons need to be pressed hard in order to make them work, keypad may need to be cleaned inside. This item is been offered as-is. 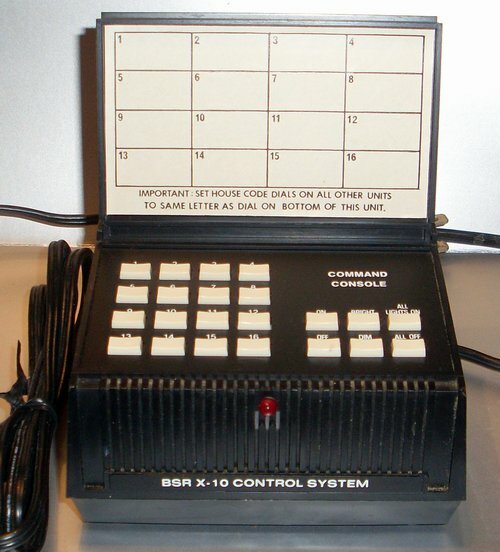 NOTICE: This Pre-Owned-Recycled x-10 remote control console bsr model x10-014311 was described to the best of our knowledge and it is offered as-is. If the field -Items in Stock- shows zero, the product is no longer available.